The product line and staff are friendly and knowledgable. 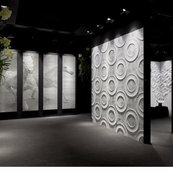 The Troy showroom is very beautiful and displays their tiles in a wonderful visual manner. Thank you very much for your comments Mary. We are very happy to work with such a talented designer. Tim Thank you so much for your comments - Your design, as always, is amazing and very much ahead of it's time!! We are thrilled to be associated with you! It was really wonderful working with you and we are so happy that your job turned out so well! We look forward to seeing photos of your completed beach home. It was very nice working with you Cyndi - Thank you so much for your positive review - Your tile looks really beautiful.